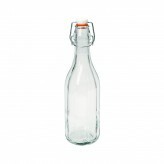 This handy sized 750ml glass faceted bottle is a handy tool for any hobby or cooking preparation required. Able to store homemade sauces and drinks, serve up some homemade lemonade in this glass bottle for ultimate style. A vintage, stylish glass faceted glass bottle from Dexam.